Our healthy summer recipes include new takes on old favourites. Light summer food that’s easy to prepare and cook, delicious to eat, and that uses loads of seasonal foods, which, although they may be available all year now, still taste best in the season they were meant for! We’ve included recipes that use fresh summer herbs like basil and chives, as well as tiny baby corn, crisp green grapes and juicy pineapple. 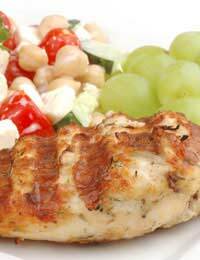 A variation on Chicken Veronique, which cooks chicken and grapes together. Place the chicken in a saucepan with the onion, carrot, bay leaf, peppercorns and enough water to cover. Bring to the boil and simmer gently, covered, for about 50 minutes until cooked. Allow to cool in the stock so it retains its moistness, then skin and break the flesh into bite-sized pieces. You can freeze the stock and use another time for gravy or soup. Or you can use left-over chicken as long as it’s moist. Beat the eggs in a small heatproof bowl with 4 tablespoons lemon juice and the honey. Place the bowl over a saucepan of boiling water – making sure the base doesn’t touch the water – and cook the sauce until thick. Cover and cool. Whip the cream till it’s thick but still soft and fold it into the cold sauce. Add the grapes, the remaining juice from the lemons, the raisins and seasoning. Mix with the chicken pieces. Serve, sprinkled with paprika, on a bed of lettuce with rice salad. A simple dish that has proved to be very popular even with children and fussy eaters. Place the basil leaves, garlic, pine nuts, olive oil and salt in a liquidiser and whizz for a few seconds until you have a smooth paste. Stir into the cheese. Cook the pasta and stir in pesto to taste. Serve topped with grated cheese or more Parmesan and a sprinkling of fresh chopped basil. Accompany with crusty fresh bread and red wine for a very simple but delicious lunch. Preheat the oven to 220 degrees C, gas mark 7. Brush a sheet of foil with olive oil and place the prepared fish on it. Brush with more oil and season lightly with salt and pepper. Place on a baking sheet and cook for about 10 – 15 minutes until the fish flakes easily. Meanwhile place the cream in a small saucepan with the bay leaf and bring to the boil. Remove from the heat and stir in the chopped chives and butter. Stir to melt the butter. Season lightly. Remove the bay leaf and serve the sauce as an accompaniment to the fish, with steamed new potatoes, and lightly cooked broccoli. Place the gammon in a large shallow dish. Pour over the juice of the 2 oranges and trickle the honey over. Sprinkle the spring onions on top and season with pepper. Cover and set aside to marinate for 20 to 30 minutes. Prepare the pineapple by topping and tailing it and cutting away the thick outer coating. Cut into 4 thick slices and remove the central core. Heat a griddle pan, if you have one, or the grill and cook the pineapple wedges and baby corn for 2 minutes each side. They should be very slightly charred and heated through. Remove from the heat and keep warm. Heat some oil in the griddle or frying pan and cook the gammon steaks for 3 to 4 minutes each side. Remove and keep warm. Add the reserved marinade to the pan and heat until bubbling. Add the chilli and season to taste. Serve the gammon, pineapple and baby corn, with the sauce drizzled over, accompanied by a green salad or steamed new potatoes.